A few days ago we told you about a new tweak called SpringBoard Invaders. This tweak turned a page on your SpringBoard into one giant game of Space Invaders using your SpringBoard icons. Today another tweak was released by the same author of SpringBoard Invaders called SpringBlock Breaker. This tweak, just like SpringBoard Invaders, will turn a page on your SpringBoard into one giant game of Block Breaker using your SpringBoard icons. 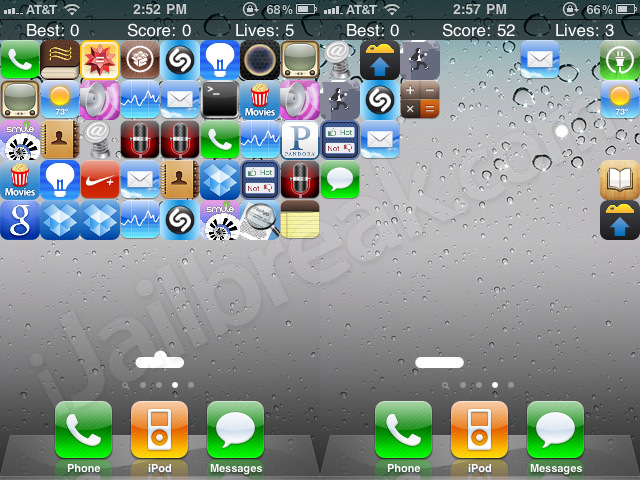 If you are interested in SpringBlock Breaker it is available through the Cydia Store for a price of $0.98. Note: In a recent update both Springboard Invaders and SpringBlock Breaker are compatible with most SpringBoard tweaks such as WrapAround. Also both tweaks are compatible with the iPhone, iPod Touch and even the iPad. Thanks to a new jailbreak tweak that was recently released into Cydia called TryGPSOut. It is now possible to transmit the iPhone’s GPS data to another iPod Touch or iPad through Bluetooth. Say for example you are going on a roadtrip with a few of your friends and one of your friends has an iPad. You can say goodbye to a conventional map, and share your iPhone’s GPS data with the iPad. Letting you take advantage of the large display the iPad has to offer while still being able to navigate thanks to your iPhone’s GPS data. If you are interested in the TryGPSout jailbreak tweak you can find it through the Cydia Store for a price of $1.00. A new tweak was released into Cydia called SuperSlider. This tweak will add some additional functionality to your lockscreen, in the fact that it allows you to launch an application directly from your lockscreen. Having the ability to launch applications from your lockscreen avoids the issue of always having to slide to unlock when you just want to access one frequently used application. Thus, saving you time and making you more productive. Besides allowing you to launch an application from your lockscreen, SuperSlider tweaks how the slider button works. Instead of the slider button always returning to the starting position if it is not moved all the way. The slider button will instead remain where you last left it. If you are interested in the SuperSlider tweak you can find it through Cydia for free. With the new tweak ArrangeStatusBar you can have the freedom to customize your iDevice’s statusbar. Meaning you have the freedom to drag statusbar elements like your carrier, clock or battery to various locations on your statusbar. Once you arrange these statusbar elements to your liking you can lock them in place through the Settings.app. Additionally if you get tired of your custom statusbar layout you can reset your statusbar to it’s default layout from the Settings.app. If you are interested in taking greater control of your statusbar you can find the ArrangeStatusBar tweak in Cydia for free. tbh, I think it’s lame. It launches directly upwards, taking out nine blocks, then the only way to hit it on a diagonal is by bouncing the ball when the paddle is moving.